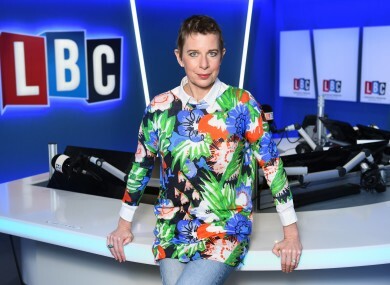 THE CONTROVERSIAL BROADCASTER Katie Hopkins is to leave the London radio station where she presents a show, the station announced this morning. LBC (Leading British Conversation) “have agreed” she will leave the radio station “effective immediately”. This move comes after Hopkins became the subject of a police review after the Manchester bombing on Monday, following a tweet in which she called for a “final solution” to the terrorist attacks. The “final solution” was a Nazi plan for the extermination of the Jews during World War II. The broadcaster quickly deleted the tweet, directed at the This Morning host Phillip Schofield. She posted an edited version as she received widespread criticism for repeating the Nazi term for the Holocaust. Hopkins’s show on LBC radio station was broadcast every Sunday. She also works as a columnist for the MailOnline. The radio station is known for outspoken personalities discussing right-wing opinions. Email “Katie Hopkins to leave job at London radio station after calling for 'final solution' to Manchester attack”. Feedback on “Katie Hopkins to leave job at London radio station after calling for 'final solution' to Manchester attack”.